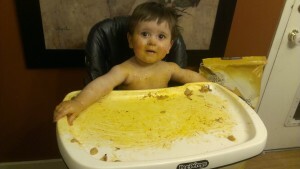 We’ve been working on solid foods with Nathan and he’s been taking to it much better than Liam ever did. (In some ways, he’s well beyond his older brother on that front.) Tonight I decided to let him finish off the can of Chef Boyardee Random Noodle and “Meat”ball in Tomato Sauce. As with anything this messy, I thought it would be a good idea to strip him down to his diaper before letting him go hog wild. As you can see, this was probably a wise choice. This is what happens when you let your infant feed himself. He had managed to cover almost every surface from his hips to his forehead in tomato sauce. 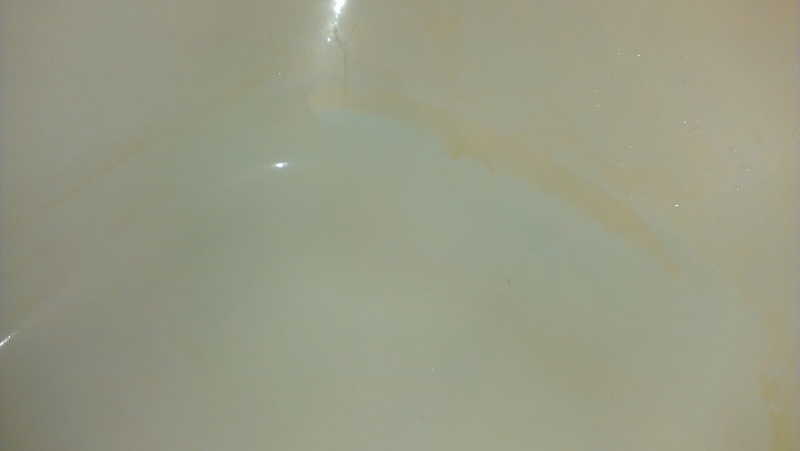 Needless to say, he went straight into the bath after that, turning what was a tub clean water into a slightly opaque oil slick. It was so bad that when I drained the tub, there was a ring of orange grease where the water line had been. I quickly grabbed the shower head and hosed both him and the tub down, fearing that I would be able to safely pick up such a well-lubricated piece of chub. Maybe next time, I’ll put a poncho on him instead. Poncho and a giant tarp, baby. My mom said she would put an old shower curtain under me when I ate. I can see why.